Our thoughts and prayers are with all those affected by the attack on Tree of Life Synagogue in Squirrel Hill. The rabbi has been in touch with the local clergy to offer our community’s condolences and blessings. The news coverage leading up to the midterm elections reminds me of a painful truth that is hard to deny: we live in a challenging time of alienation and isolation. There is much discussion of the loss of personal (and in-person) interaction, the decline of social organizations (including places of worship), and an increase in loneliness or, its twin, narcissism. It seems that many of us today shift back and forth between the sadness of being alone and the assertion that we and our whims are all that matter. My teacher and recently installed Hebrew College President, Rabbi Sharon Cohen Anisfeld, reminded me several weeks ago of the extent to which Jewish life and teaching push us away from this type and thinking to a very different insight: our individual inadequacy should be a source of joy. Pirke Avot (ch. 10) hints at why this might be necessary. It lists 48 virtues that are required for acquiring Torah. Some of these relate directly to the student: attentiveness, a perceptive heart, insight, minimizing distractions, patience, awe, humility. Others address the student’s relationships: ministering to one’s teachers, clinging to one’s colleagues, knowing one’s place, contentment with one’s lot, loving God, loving all creatures, crediting one’s sources. These latter make it especially clear that truly worthwhile achievements are accomplished in relationship. If narcissism is the bandaid that we place over our feelings of loneliness and inadequacy, it may indeed bring relief but at the cost of healing. For what we truly need is each other. It is through teaching each other, complementing one another’s strengths, appreciating and honoring each other, that meaningful change happens. As we head closer to winter, may we each strengthen the bonds that tie us to one another and that make true healing and growth possible. Adam Camerer, Lorne Carter, Xavier Cruz, and Madelyn Fisher! Seth & Kim Arum are happy to invite the congregation to a Kiddush luncheon following services on November 10, when their daughter, Callia Arum will be called to the bimah as a Bat Mitzvah. I will be donating unclaimed glasses next month. Thank you to everyone who has submitted their membership pledge forms! If you haven’t sent back your form yet, please return it to Sarah Jane in the office as soon as possible. Thank you! Dave Fashing is looking to hold a game and trivia event for baseball fans in the community, most likely Nov. 25, and he needs a few volunteers to help him organize and run the event. Please call Dave at 978-534-9550, or contact the office 978-534-6121 or reply to this email. We are looking to improve our sustainability practices here at Congregation Agudat Achim. If you would like to be involved in helping us reduce our carbon footprint, we would love your help! We will be forming a committee to look into ways to reduce waste and increase efficiency. We would especially like to invite our youth members to get involved and share their ideas! Please contact the office to sign up. 978-534-6121, or reply to this email. 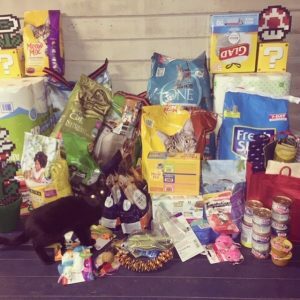 A big Thank You to everyone who donated to the cat shelter for Oliver’s Bar Mitzvah! 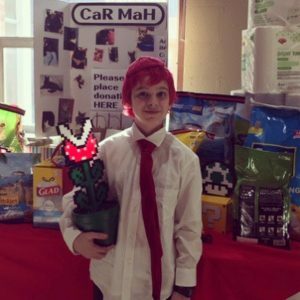 “Oliver used his Bar Mitzvah to collect donations and raise funds for CaRMaH. Our own Gail Joseph is the featured artist at the Leominster Public Library for November! Free parking in the lot behind the library, on Pearl St.
On Friday night, November 2nd, we look forward to welcoming the youth from First Church in Sterling to continue their study of Judaism through a discussion with us at 5:00pm, followed by Kabbalat Shabbat at 6:00pm. It would be wonderful and enriching to have our families participate that evening as well. The following Sunday, November 4th 12:00-2:00pm, a group of Christian students will visit us at the synagogue and the Rabbi will lead a program introducing them to Judaism. Please consider participating to help welcome them, take part in discussing their thoughts and questions, and thinking about Judaism through their eyes. set-up the week before, during the Sale, and break-down on Nov. 4, 11:30 a.m. to 1 p.m.
for a special Havdalah service and Melaveh Malka songfest, followed by classes led by local Rabbis, cantors, and Jewish educators. These hour-long classes will be offered from 7:00-10:00, followed by a dessert reception and social hour. Please join other local congregations for an interfaith service on the afternoon of Sunday, Nov. 18. Each congregation is asked to bring cookies to share for a “potluck reception” following the services, as well as canned and dry goods for the offering. we wish to thank [Congregation Agudat Achim] for your generous donation of assorted goods [from your High Holiday donation drive]. Thank you for your continued support of MIHN and our families. Thank you so much for supporting the MIHN homeless shelter. for interfaith discussion, 5:00pm all youth welcome to join! **Set your clocks back on Saturday night! for introduction to Judaism w Rabbi Zehavi 12:00pm – 2:00 pm all youth welcome!